It has been more than a year since my cancer surgery, and yet, every day we get questions about my health. The care, concern, and prayers of so many is deeply touching. Over the summer I had a number of tests to follow up, and I am happy to say that I am cancer free again. Thank you for your prayers and kindness. I am very grateful. On December 19, I will be having minor hernia surgery. This should be a routine surgery and while it will impact my ability to move around and drive for a couple of weeks, it is not cause for concern. Though I do ask you to pray for me and for my surgeon on that day. This has been an incredible year for Dynamic Catholic and that would not have been possible without you. Thank you for all you do to support the mission. And I look forward to a wonderful 2015, serving the Lord and helping the Church alongside you. The Lord does not disappoint those who take this risk; whenever we take a step towards Jesus, we come to realize that he is already there, waiting for us with open arms. The great danger in today’s world, pervaded as it is by consumerism, is the desolation and anguish born of a complacent yet covetous heart, the feverish pursuit of frivolous pleasures, and a blunted conscience. Whenever our interior life becomes caught up in its own interests and concerns, there is no longer room for others, no place for the poor. God’s voice is no longer heard, the quiet joy of his love is no longer felt, and the desire to do good fades. This is a very real danger for believers too. Many fall prey to it, and end up resentful, angry and listless. That is no way to live a dignified and fulfilled life; it is not God’s will for us, nor is it the life of the Spirit which has its source in the heart of the risen Christ. I invite all Christians, everywhere, at this very moment, to a renewed personal encounter with Jesus Christ, or at least an openness to letting him encounter them; I ask all of you to do this unfailingly each day. No one should think that this invitation is not meant for him or her, since “no one is excluded from the joy brought by the Lord”. The Lord does not disappoint those who take this risk; whenever we take a step towards Jesus, we come to realize that he is already there, waiting for us with open arms. Now is the time to say to Jesus: “Lord, I have let myself be deceived; in a thousand ways I have shunned your love, yet here I am once more, to renew my covenant with you. I need you. Save me once again, Lord, take me once more into your redeeming embrace”. How good it feels to come back to him whenever we are lost! Let me say this once more: God never tires of forgiving us; we are the ones who tire of seeking his mercy. Christ, who told us to forgive one another “seventy times seven” (Mt 18:22) has given us his example: he has forgiven us seventy times seven. Time and time again he bears us on his shoulders. No one can strip us of the dignity bestowed upon us by this boundless and unfailing love. With a tenderness which never disappoints, but is always capable of restoring our joy, he makes it possible for us to lift up our heads and to start anew. Let us not flee from the resurrection of Jesus, let us never give up, come what will. May nothing inspire more than his life, which impels us onwards! How do you go about buying presents for everybody on your list without getting caught up in the trap of consumerism? How can we spend so much time and energy with the material elements of the season and still prepare spiritually for the Son of God to be made flesh in our midst? Maybe we can’t! Maybe we have to admit we will probably be tinged by consumerism and materialism. If so, we will have good material for the Sacrament of Reconciliation. Good thing Lent is just around the liturgical corner (Ash Wednesday is February 15). How do we “seek first the kingdom of God” in the midst of a Black Friday that lasts for 10 days? Would it be helpful to offer a prayer for the recipient of each present at the time of purchase? Would purchasing only gifts that are environmentally friendly help? Would making a charitable gift to some worthy cause in the name of the other person be acceptable for some? Really generous people are true givers, not expecting anything in return. Just like God giving us his Son while we were still sinners, not having any assurance that we would accept his gift. And we didn’t! But the Christmas love story goes on, century after century. Maybe your household has found a holy way to celebrate that Holy Day. Can you share what you do with us? In the meantime, let’s have the best Advent ever because Jesus Christ is coming to town. A few years ago, I set out to read all of the books that had begun collecting dust on my bookshelf. Thankfully, most of these were great Catholic books that had been given to me by my parents, the “prayer giants,” as Matthew Kelly refers to them, of my family. About halfway through this process, I read Rediscover Catholicism and The Four Signs of a Dynamic Catholic, which helped further ignite my passion for proclaiming the beauty, history, and tradition of my Catholic faith. 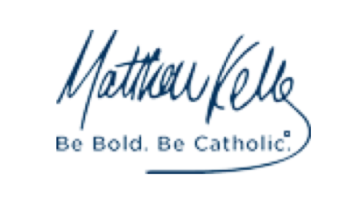 Since discovering Dynamic Catholic and Matthew Kelly, my parents, sisters, and I have attended Matthew’s Passion & Purpose events, ordered nearly 100 books and CDs for ourselves and for others, become Ambassadors, and participated in the initiation of the Parish Book Program in two states. Dynamic Catholic has provided us the common platform to learn more about our faith, to enter into meaningful dialogue with others regarding Catholicism, and to find the courage to ask and answer the tough questions that lead to truth. As a family, we are passionate about spreading the vital mission of Dynamic Catholic. As members of the Catholic faith, we are increasingly thankful that this great organization exists to do God’s will on Earth. 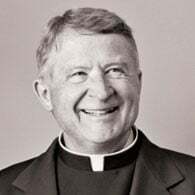 While reading another Dynamic Catholic book recently, John Wood’s Ordinary Lives Extraordinary Mission, I was moved by his brilliant idea to raise funds for the Parish Book Program while training for a marathon. Through the extremely generous donations of nearly 50 friends and family, I was able to raise more than $3,000 to buy The Four Signs of a Dynamic Catholic for 1,500 parishioners. I am blessed to serve with six others on the Spirituality Formation Team at my parish, and we are thrilled to pass the books out at all Christmas Masses this year! We plan to follow up as a team with workshops on each of the four signs in early 2015 for our parishioners. 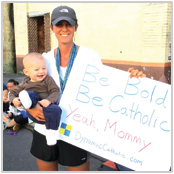 Raising the funds for the Parish Book Program in conjunction with running the Portland Marathon in October helped combine three of my passions: evangelizing my community about the genius of Catholicism, modeling faith in action for my young son, and challenging myself with a personal goal. 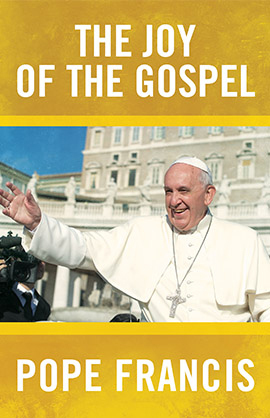 I am overcome with gratitude for all of the people who helped bring this dream to fruition and am overjoyed to be a small part of furthering the vision of Dynamic Catholic. We are all but instruments in the hands of God. How will you let God use you as his instrument today?